Asparagus is one of my favorite veggies. And although I do snack on it raw occasionally, I actually prefer it cooked, unlike my other two favorite veggies–sugar snap peas and green beans. I have seen three posts for roasted asparagus lately and since it’s in season and was a pretty good price, I picked some up to use as a healthy side dish for dinner. I went with the first recipe I saw from my favorite food blog, My Kitchen Cafe, which incidentally I saw repeated when Real Mom Kitchen reposted the recipe. I think Mel has started a chain reaction! I usually steam asparagus and never minded it being sort of limp until I tried this recipe and delighted at the fresh crunch it still had after being roasted! Tender & crisp=asparagus perfection in my book. If you want to change things up, you can add garlic powder, parmesan cheese, a squeeze of lemon juize, balsamic vinegar or whatever your creative mind comes up with! Preheat the oven to 400 degrees. 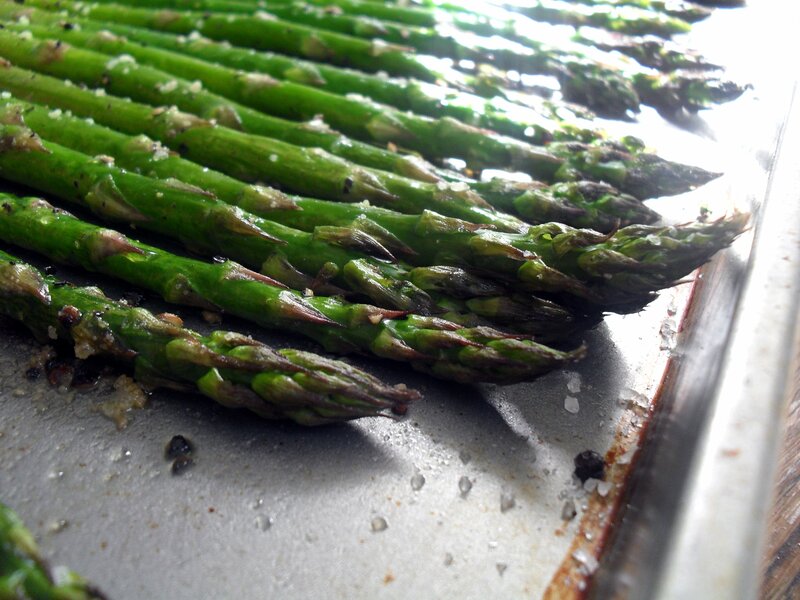 While the oven is preheating, gently break off the lower ends of the asparagus. This is the tough part that isn’t so great for eating. The asparagus should break naturally when you bend the asparagus about 1-2 inches up the stalk. Discard the lower, tough portion. 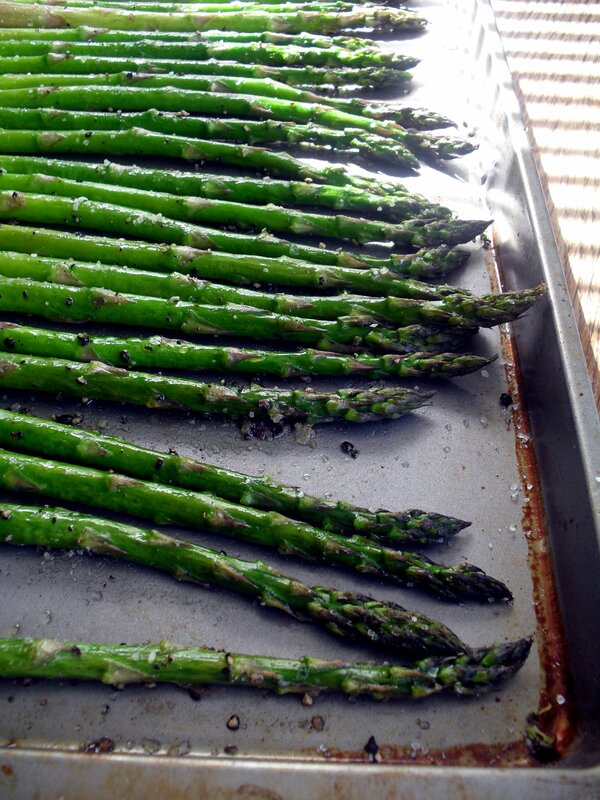 Lay the asparagus in a single layer on a rimmed baking sheet. Drizzle with the olive oil. Using your fingers, gently roll the asparagus to evenly coat with the oil. Sprinkle the asparagus with salt and pepper. Again, lightly roll the asparagus so the salt and pepper gets evenly distributed. Bake for 10-12 minutes, checking often the last one to two minutes of baking, until the asparagus is tender when pierced with a fork. Serve immediately. I’m still thinking about the raw veggies I enjoy. What are your favorites? Have you ever tried eating raw sweet potato? My Mom used to slice raw sweet potatoes up into thick french fry shapes and put them on veggie platters. My friends and I had no idea what they were, but we loved them and they always disappeared first. For years Mom wouldn’t tell me what they were! I guess she thought I’d stop liking them if I knew it was a sweet potato and not an exotic vegetable. Posted in Lighter Fare, Side Dishes, Vegetarian & Vegan and tagged roasted asparagus. Bookmark the permalink. I love asparagus, too! I’m waiting for it to go on a bigger sale…and then I’m jumping on them! Hee! These definitely look PERFECTLY roasted! yummy! Wow, that’s a new one on me! I love nori, so I bet I’d love it. Thanks! You’re the the 3rd person to tell me that! I will def have to try it. I used to hate asparagus (and most veggies!) growing up because my Mom cooked them to death. 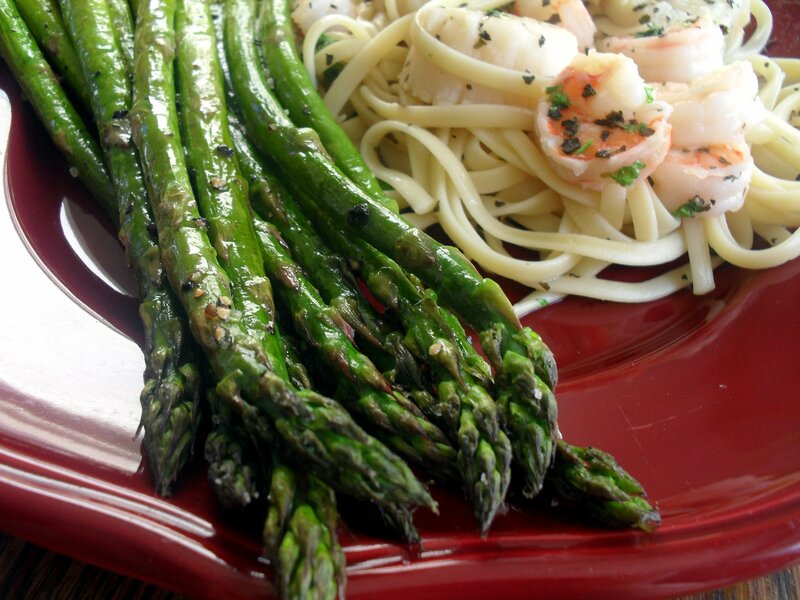 I love having asparagus still on the crispy side – so delicious! I love your blog, Biz! I don’t talk about it here, but I am diabetic and you inspire me with your healthy eating.